These are some designs for a simple home-made chassis suitable for the Ultralight and other very lightweight teardrop trailers. 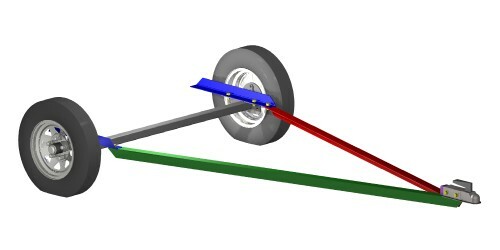 All have the same basic layout of an angle A-frame tongue connected to short pieces of angle to which the axle and body mount. The designs use only rubber torsion axles as a leaf sprung axle would require more transverse strength. 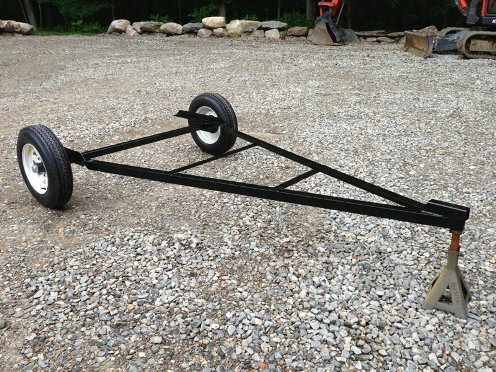 The design is called Ultralight because that is what it will support - it is not a design that is suitable for medium or heavy weight trailers or bodies over 8 feet long. 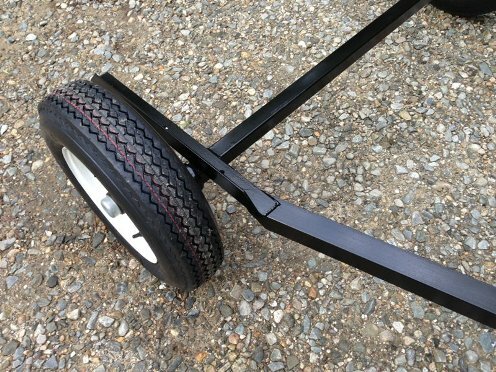 Each plan lists the weights of trailer that it is suitable for and the maximum length of tongue (from front of trailer floor to hitch) - do not exceed these limits. 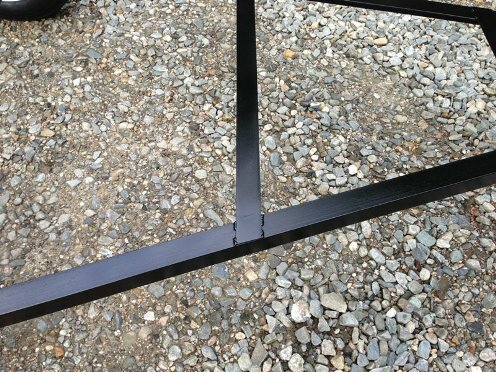 The plans allow a single 3/8" bolt hole in each A-frame member where it passes under the front of the trailer floor - do not exceed this size hole. This chassis design assumes that the teardrop body has been constructed sufficiently well that it will support itself - this is only likely to be true if all the joints in the body are glued. There are four versions of the plans to suit body wdiths of 48 and 60 inches, and to suit bolted or welded construction. b) provide somewhere the body can be bolted to without drilling any holes in the two main rails - so it avoids weakening them a bit. One nice thing to note on Michael’s frame is how the flat bars are welded to the main rails by fairly small welds, little more than big tack welds. These will provide ample strength but don’t add lots of weld-induced stress that bigger welds would. With welds, ‘just enough’ is stronger than big.